Only since the beginning of June 2013, the new Aderlass Absinthe is ready. He was formerly produced by the distillery Matter-Luginbuhl in Switzerland, it now appears that another distillery for this absinth is responsible bloodletting. He is now, however, produced on the basis of a Swiss La Bleue in conjunction with a pure natural green color of plants. 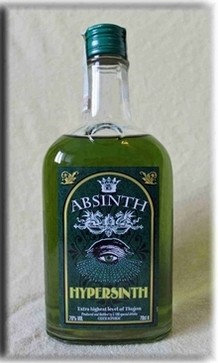 Enjoy Absinthe Aderlass with 3-4 parts ice-cold water. It is important for the dilution, the water is poured slowly. The possible preparation variants are: the Bohemian drinking variant flambé with sugar, on the rocks or as a cocktail with different fruit juices. 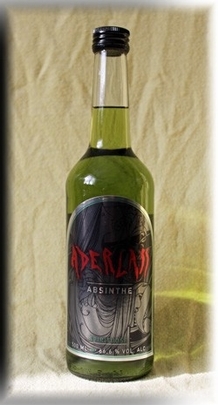 Here Aderlass Absinthe is available in the large 0.5 liter bottle with an alcohol content of 66.6% vol. alc ..Hier ist der Aderlass Absinth erhältlich in der großen 0,5 l Flasche mit einem Alkoholgehalt von 66,6 % vol. alc..